My previous reviews of Chomu Press books are linked from HERE. 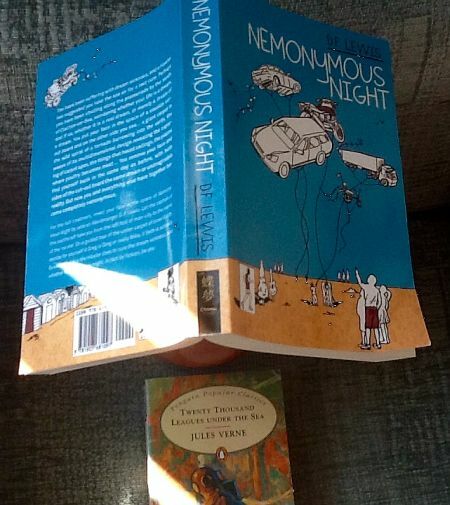 A previous independent real-time review of ‘Nemonymous Night’ HERE. My real-time commentary will appear in the comment stream below as and when I re-read this book. There’s nothing hard about NN. You’re just being hard on yourself. I shall try to prove that…. Starts with a carpet and finding’s one feet. It’s like going up and down in a lift, soon to be known as hawling, as you go through each floor towards the Earth’s Core where Jules Verne waits to take you on a guided tour. The trouble is that you’ve got to know who you are and clarify your relationships with others first before taking such a journey. And the characters here are just doing that. It takes time to do that in real life, so why not in a novel? Parts of me turn up, like entertaining clients at a classical concert. Parts of you turn up, too, whoever you are. Are any of your children bewitched? Another narrative raft: Meanwhile, like you, the characters are gradually sorting themselves out into who they are and are gathering in the pub before setting out to search for two missing children. This commentary is that very undream helicopter? These pages contain a long description of this book’s zoo, where dreams are possible but you know they are dreams, unlike in the rest of the city. This book is more like its city than its zoo. This can be compared with my belief that Area X is not the Area X described in the book entitled AREA X but is that book itself. (My review of AREA X is here). Literature is all there is. Books like this one that navigates toward the centre of the earth, the earth being the place you stand on, crowded with a grasping of things you believe one day, disbelieve the next, or things that grasp you, you as children, later you as someone else who uses a dream as an excuse to do bad things. This section has the scene from the book’s front cover, except it’s a greensward or park, not a beach. And they’re not really kites, except they appeared like kites at first rather than the flying craft they eventually became. So this cover is the glimpse of a dream rather than its eventual reality. The book is its own dry dock. But when you close the book, you have nothing but yourself and that cover. Novels get you nowhere. Novels get you everywhere. An open and shut case. Two parties are seeking the missing ‘children’ (‘children’ escaping or being enticed to some form of Isis-state toward the Earth’s Core? ); one party seeking them down manholes North of Man City and another party is destined to seek them via a Jules Verne Tour below ground, via various surfaces of carpet stone and inner worlds as words. Some descriptions here that I had completely forgotten, and implications not realised before, some via playlets of dialogue and some by fibrously Yellow computer webs on screens. Quite an experience to re-read this book; it is as if I never once wrote it. Honestly, that’s how it feels. And I now wonder if the normal accretive emergence of self and relationships to others as a human baby (that we all once experienced) has now been transferred, by this book, to the whole duration of each human life into our adulthoods and beyond. I have just been reminded by the NN text that Hawler is a town in Kurdistan, aka Erbil, quite close to the Isis threat today, years after I wrote NN. I also note that one of the ‘children’ being enticed is named Sudra… And later appearance of Hataz and Tho. “The western airport area – now overgrown like a long-forgotten golf course – reminded him of another derelict airport he had seen on the web as part of his dream research. This one was in a place called Hawler – where was it? – in Kurdistan? Whether the city airports were connected with this middle eastern one in some way was uncertain, yet Ogdon believed in complementary ley-lines veining the whole surface of the earth, proud as inflamed swellings on a human body … invisible to most uncaring eyes as the eyes’ owners conducted their selfish lives on a daily basis, lives only interspersed with sleep or with whatever sleep contained. The two ever-regrouping parties of characters interweave the start of their respective journeys to the Earth’s Core, one party in a land of Redoubts similar to Hodgson’s Night Land, the other towards a beach area down south where the helicopter-vaned Drill is set to penetrate the ground with them on board and with the promise of daylight fireworks to celebrate their departure. In fact, the scene from the book’s front cover may, on second thoughts, be based on this section rather than the one I identified earlier. Or I may have been telling lies. But reviewers can’t tell lies. They just say what they think and who can argue with that? I have shown the whole text of these pages HERE, as I feel it is a crucial passage for any reader, up to this point, who is still without his or her own personal narrative raft! Another crucial section here regarding the dual quests, the slippery identities involved, the conspiracies back in Man City regarding the angel wine and Angevin being harvested at the Core, despite its as yet nameless Corekeepr… And a sort of fairy story concerning the young girl or young woman named Sudra who is taking on a more prominent role as enticed and enticer. And a silent curtain runner from Twin Peaks! I shall never forget the first time when writing about the Drill craft emerging, at least for a short while, from threading earth’s slabs and rocks, to an open sky where the Core is a new sun. The most wonderful scene in all Literature? Well, I shall never know, because nobody has said one way or another. On the objective face of it, there is nothing quite like this novel. Nothing even near it. But that doesn’t make it good. I have now finished re-reading it until the end of the ‘Nemonymous Navigation’ section. There may well now be a necessary interlude, while I go into Dry Dock myself, before I resume this ‘review’. Reading this afresh, there is something intriguingly déjà-vu about this opening of ‘Nemonymous Night’, tantalisingly skewed and obliquely matching what went before. Like the blending of various varieties of meat and poultry, and the act of hawling itself. The gentle shifting of relationships, evolving like the relationship of Amy and Sudra. To be quite frank, this book is much better than how I remember it. But that, of course, does not mean it is any good! Only a book like this one could possibly elicit such a straight-faced comment from its author. Solely independent readers can truly judge and, based on the sparse reaction over the last few years, the jury is still out! A stop-off for Captain Nemo’s Drill in Klaxon City where its passengers witness Sunne-Stead and where the distant Sunne is the Earth’s Core whither they are eventually to reach. Got it? Don’t go there! And I haven’t even to told you about the marigold-window, the pylons with tethered spacecrafts, or, amid the other party elsewhere in their journey to the Core, the developing relationship of Amy and Sudra, plus Arthur’s non-matching ears. It all makes sense when you read it and let it flow over and into you willy nilly. One of the Two Towers spearing the other. As well as a battle of history versus history, here we have two characters each writing a novel, a battle of novels, one wanting a happy ending, the other not. Insect meat. And a bomb in the Moorish part of the city. Skies and worlds above one another, fighting to reach the multiple cores. Man City itself descending to attack other cities. Or am I getting ahead of myself, having read this book before? I hope you can treat this review with the sangfroid sense of humour it invites. These pages contain more passages of disarming déjà-vu, and trial consolidations of character, as the two separate parties continue their ways to the Core. Plus a long passage concerning a couple named Tho and Hataz who struggle with their relationship while, now I read them afresh, interspersed with striking descriptions of a certain frightening nature of dreaming that Tho has been having. Not dream sickness so much as dream separated by skin. These new characters are sure to be met again. Or plainly not good enough for the world? – I should have added at the end there. A novel that was first drafted in 2005 and published by Chomu Press in 2011. I happened to start wondering today if my novella LADIES from the 1990s (where the Ladies form some spiritually menstrual pact against men) has a sororal connection with the ‘Warriors of Love’ duodecology? There is a death of one of the characters in this section. The circumstances and which character I will not divulge for fear of spoilers. Later, almost simultaneously, the two parties reach Agra Aska which is the nearest city to the Core, with its straddling cathedral and other visionary aspects (aspects recalling the previous novella ‘Agra Aska’ that I wrote in 1984 and was first published in 1998). I now seem to be getting closer to the Core of this autonomous novel itself. It once seemed diffuse; it now has tightened, focussed in my mind. This in the antechamber before the characters finally arrive at the Core and see its Corekeeper. This meeting of the two parties seems to involve a type of TV Reality Game. But they soon leave towards the Core and there follows what is the astonishing (yes, even astonishing to me) climax of this ‘Nemonymous Night’ section, a climax which might strike you as the natural climax of the whole book. But I have at least another third of the book’s pages still to reread and comment upon! It is as if the book NN has gone into a different gear, more crazy or complex, but paradoxically more sane and graspable? Greg and Beth (originally from Clacton) travel to the inner world’s version of Klaxon City, where sirens wail, Bird Flew rages, with Healing Chambers and Lethal (Robert W?) Chambers…. This is the same Greg and Beth who once visited the Core with Mike, Susan et al and it is here explained how they are again travelling toward the core as if they have never visited it before. And a stub of pencil is again annotating the text, but more often than before, reminiscent of my marginalia pencil that I have used when Dreamcatching books in the more recent years since I wrote NN wherein this stub of pencil first appeared. There are 380 pages in this novel. So there are another 100 pages left in this ‘Apocryphal Coda’ and still much else for me to say before this real-time review finishes, at which point I can rest. Do join in with sub-comments if you wish. Stub of Pencil entry on Page 276 of first edition of NN as an example: HERE. Things get very much like that in the novel, too, I guess. Yanking meaning from the vexed texture of text. Plus existential arguments with self in a mirror. Greg and Greg Flew. You would have read nothing else like this novel. Feel glad that you escaped it and only read this authorial commentary upon it. We find Sudra again, now a beautiful woman, running a shop – Sudra’s Shoes – in Klaxon City. Or is it a museum? Wars always bring confusion. But, wait, here comes the WEIRDMONGER, literal soothsayer, for the first time in this book, cinematically across the mudparks, to visit Sudra’s Museum and Sudra herself. The reader as ‘onlooker’ of possibly the most striking vision so far, and that, is saying a lot. Or a little. Written via a text to die for. Based on all the evidence, I invented the word ‘Weirdmonger’ with my story of that name published in 1988. I note some unknown organisation recently bought the domain weirdmonger.com and is about to produce a website. This domain was owned on my behalf by Garry Nurrish from 2001 until, I think, around 2010. Based on all the evidence, too, I invented the word ‘Nemonymous’ in 2001 and nemonymous.com has belonged to me from then and is in my name until at least 2017. Sudra was in her bedroom of the shoe museum listening to the newly prepared armies march-running towards war through the cutaways of Klaxon – measuring the pavy-crazed sluices between the lobes with the rhythmic onward march of their medium-pace limbs in running mode as opposed to any standard patterned walk. March-running is a forgotten art. Neat ranks of soldiers (mostly female), these were, keeping perfect pace with each other at the run, rather than the lift-and-separate of slow-motion goose-step or slightly quicker frog-march or general English slow marchpast for Trooping the Colour or Remembrance Sunday. Memories of Things Past – a hypnotic echoing march-run as the various sections of army proceeded – half in and half out of Sudra’s dreamtime perception of them from her bedroom window – towards their billets in the various establishments of darkening Klaxon. Arguably, some of my syrupiest prose, as the Weirdmonger with his word-truth mythos of catch-ball and Wagger Market continues to haunt Sudra. As does Lope, too, who, give him his due, tries to balance constructive reality against such confusions. A new area of Inner Earth: Whofage, about which Greg will write a separate novel concerning his adventures there before he reached his Core Communion itself. There now follows an absorbingly sporadic speech as brainstorming, personal to ‘Nemonymous Night’ itself, a digression upon the explicit expression ‘Null Immortalis’ and the healing powers of fiction, even to the extent of this very novel keeping our world safe from Avian Flu ever since, inferentially, its altruistic publication by Chomu Press in 2011. Mike’s happy ending to his novel, rather than Ogdon’s unhappy one to his? There follows a train journey through Inner Earth – strangely visualised – with Greg and Beth and their two children, Amy and Arthur. A Poliakoff type anxiety with the train still steaming at Whofage ‘station’ as they explore the city before hoping to re-board it before it leaves for Agraska and the Core. The closing sections of this book cover Greg and his family continuing a seemingly endless break in Whofage from the train journey. Did they ever reach the Core as the first half of this book portrayed? Who finally is the Corekeeper? What is the final significance, if any, of this extremely (provide your own adjective here) book? Also there is another speech or digression, one that seems to support my earlier contention above that this book — although, here, in this speech, depicting a conveyance of babies becoming selves, then as children developing in a speeded up fashion rather than a slowed down one — tries to slow that process down again, to give us back our pre-Internet humanity. I hope you agree. Also in these closing pages, we have a series of passages or stories that form a quilted coda to this book, disarmingly oblique. I predict that the eventual battle for Erbil (Hawler) will decide the future of our world. There is something beautifully but disturbingly striking about Kazuo Ishiguro’s new novel ‘The Buried Giant’ that I started real-time reviewing yesterday. It as if my conceit – the one in ‘Nemonymous Night’ where the characters have their ignition and initial development of self-identity and relationship as babies and infants slowed down and stretched onward into their adult lives – now crystallised by Ishiguro’s recognisable period in our ancient history, a period which we can recognise or accept as what it was like then.